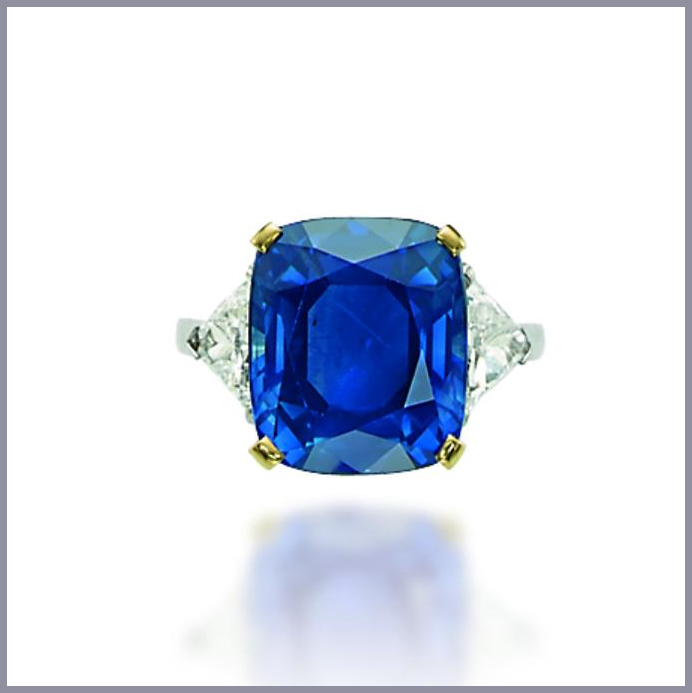 Considered one of the most infamous gemstones in the world, the Kashmir sapphire is so rare that is hardly ever seen. One exception to this is the appearance of Kashmir sapphires in museums or various photographs. The discovery of new sapphires in Kashmir is very rare. Kashmir sapphires are valued as significantly as they are because they contain only the best specimens. These specimens are noted to have a superior cornflower blue tint with a sleepy quality to them. Most describe them as ‘blue velvet’. While some Burmese and Ceylonese sapphires come relatively close in quality, only the Kashmir Sapphire continues its reign of King of the Sapphire World. The extreme rarity of this valuable gemstone surrounds them with an almost mythical allure. Kashmir sapphires descend from a remote part of the Himalaya Mountains known as the Zanskar range. The mines located in the Zanskar range while widely known for bright, blue sapphires, also have been known to produce . When the Maharaja of Kashmir heard of the presence of the bright blue beautiful sapphires, he posted guards outside of the mines to protect their value. From the year 1882 to 1887, the mines were worked day and night throughout the summer months until the mines were depleted. It wasn’t until 1887 that a geologist discovered that the sapphire stones, some as large as eggplants, originated from two separate locations. One location, known as the “Old Mine” included the pits within the valley and a second location which included the valley floor just below the Old Mine. To access the mine, the beginning journey is quite dangerous and challenging. The journey started by traveling over the Chinab and Wardwan River to cross a rope bridge which was elevated 11,550 ft in the mountains. 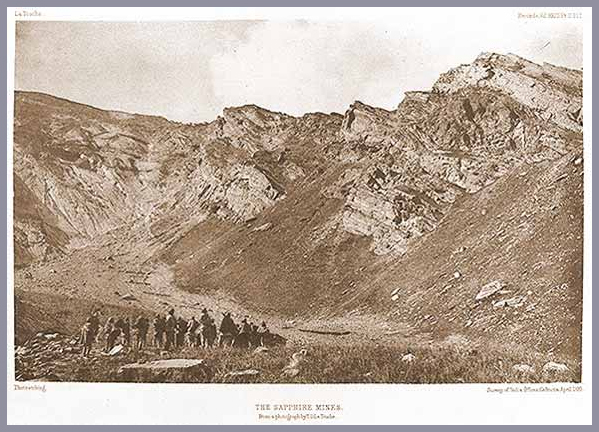 The Chinab River ran through deep and quite narrow canyons which made traveling even more difficult. This portion of the travel took 5 days, even though it was only 24 miles long. The mines have been worked many times since these dates, but few sapphires have been produced as a result. The Kashmir sapphire is the most famous type of sapphire in the world. Newly discovered ones are extremely rare as the material existing still was discovered well over 100 years ago. 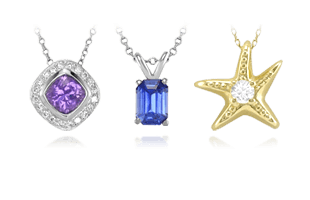 They are highly sought after because they are the epitomy of a near perfect sapphire if there ever was one. They have a superior cornflower blue hue to them with a mysterious and almost sleepy quality. Some gem enthusiasts describe this as ‘blue velvet”. While some of the very best Burmese and Ceylonese sapphires come close, they can never compare to the Kashmir sapphire as it continues to be the pinnacle of all sapphires in existence. The extreme rarity of the gem gives them almost a mythological reputation. Cartier bracelet with 65.16 carat Kashmir sapphires in a cushion cut. Theft of the sapphires is always a constant problem, even today. There have been many attempts by gangs of hardy smuggles who are ready to pounce to take advantage of the remote location of the mine. Today the entrances of the mine are heavily guarded to prevent anyone from entering. The area is watched closely by a small group of private police. The story of the most recently Kashmir sapphire theft reads eerily similar to a mystery novel with plot twists and turns and a second theft. 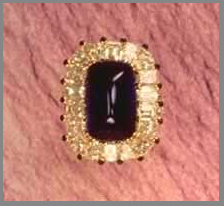 It takes place in the year 1996 when Horovitz & Totah Jewellers held an auction for a Cartier bracelet with 65.16 carat Kashmir sapphires in a cushion cut. Days before the anticipated auction in Geneva, the auction house, Antiquorum had this piece on display at the Four Seasons Hotel in local Milan. 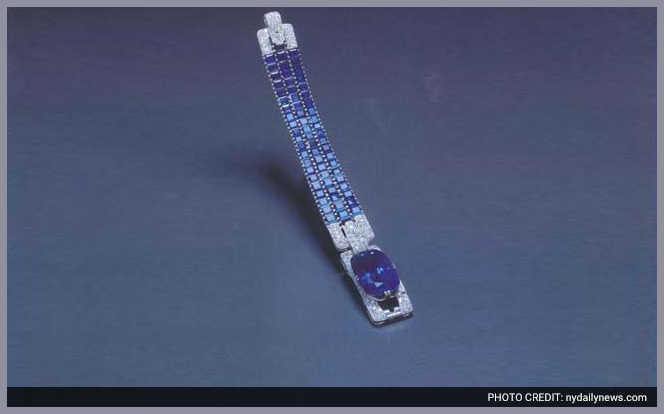 More than 50 people were in attendance in the same room as the Kashmir sapphire bracelet when it disappeared. The jewelers insured the bracelet for $1.8 million and put the incident in the past. It wasn’t until November of 2015 when H&T jewelers received an email with a scheduled viewing of a 59.57 carat Kashmir sapphire at an auction in New York that they considered its original origin. 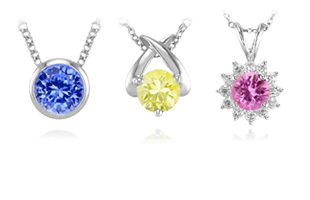 Even though the stone was smaller than the one that was stolen, H&T jewelers didn’t think anything of it, because when gemstones are stolen, thieves oftentimes file them down to make them weigh less, or have a different shape. H& T contacted their insurers to discuss with them their suspicions about the gemstone on auction in New York. 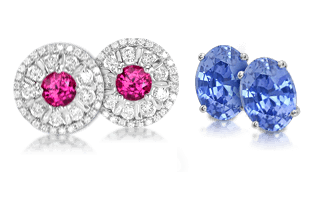 When the insurers contacted the auction house, they learned that the sapphire was withdrawn from auction and was sent back to the original owner who was undisclosed. Sapphires found at the new mines in 1952 are different than those that were originally discovered at the Old Mine. To understand the difference you have to understand Kashmir material. The new mine Kashmir’s were of two different types. Both types were coated in a white clay. Each type featured a blue outer edge, especially around the tips. Almost all sapphires found in the new mines are of a hexagonal pyramid shape. The second type of Kashmir Sapphire found in the new mines was often missed because those searching did not recognize them. Most often mistaken the sapphires for a Ceylon. The new mine Kashmir’s beared a resemblance to the infamous Sri Lankan ottu stone. The main characteristic of these types of stones is the way they are cut. The stone is layered parallel to a pyramid face. This provides a more vivid appearance but the stone also loses its velvet softness. 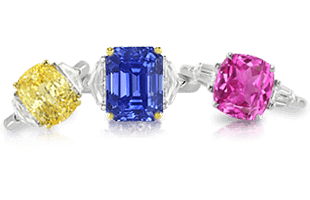 Many of the new Kashmir sapphires often display this colored feature. The vast majority of sapphires from the new mines lose their blue hue due to the corrosion. New mine sapphires are missing the flat, formed face of the old mine sapphires. However, there is a large scarcity of these fine Kashmir sapphires from the Old Mine. These sapphires were more evenly colored compared to the new mine ones, but the mine has produced almost nothing since the year 1887, which is why these sapphires are rare gems to be found. Sapphire color only in the middle, a deep blue corundum similar to that of a beautiful body of water. Sapphire tinge in various places, some small black crystals which are embedded. The hallmark of the Kashmir Sapphire is its velvet-like texture with a slight haziness appearance. When under magnification this is shown to be many fine particles in various directions. 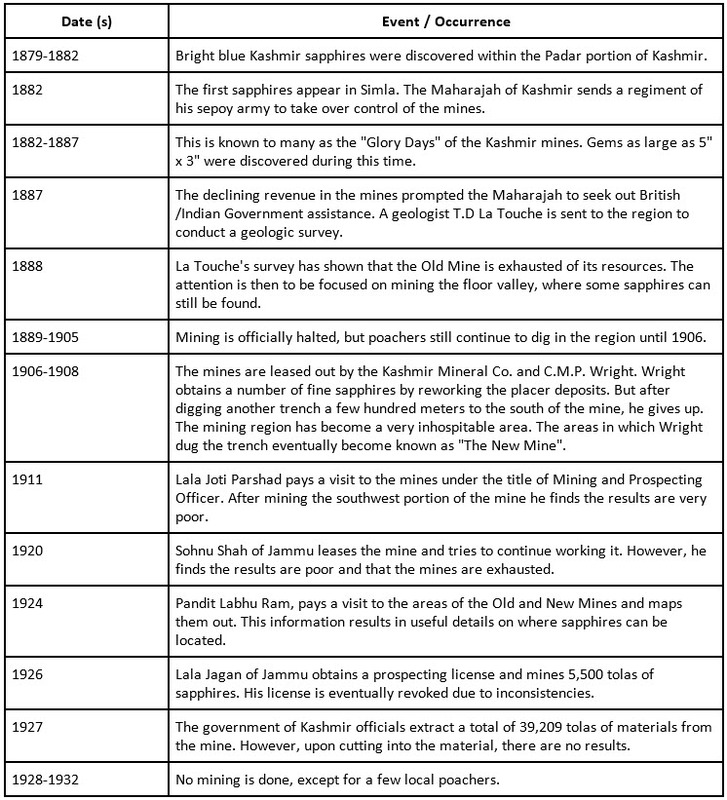 We have discussed the lack of production from the Kashmir Old Mines, but is it completely dry, or are there riches that still lie waiting to be discovered for those that are willing to explore them even further? The answer to this isn’t as simple as some may think. That is because it depends on the nature of how they occur. Kashmir sapphires occur when pegmatites cut through limestone. Heat from this occurrence results in the limestone metamorphism into marble when corundum begins to form at the edges. This results in heat occurring in more than only one area. This means the discovery of sapphires in the old Kashmir mines may be much more widespread than many originally thought.